The food gods have been kind. Last December I went to a one-off meal prepared by star Mexican chefs and René Redzepi, for some years number-one chef in the world. 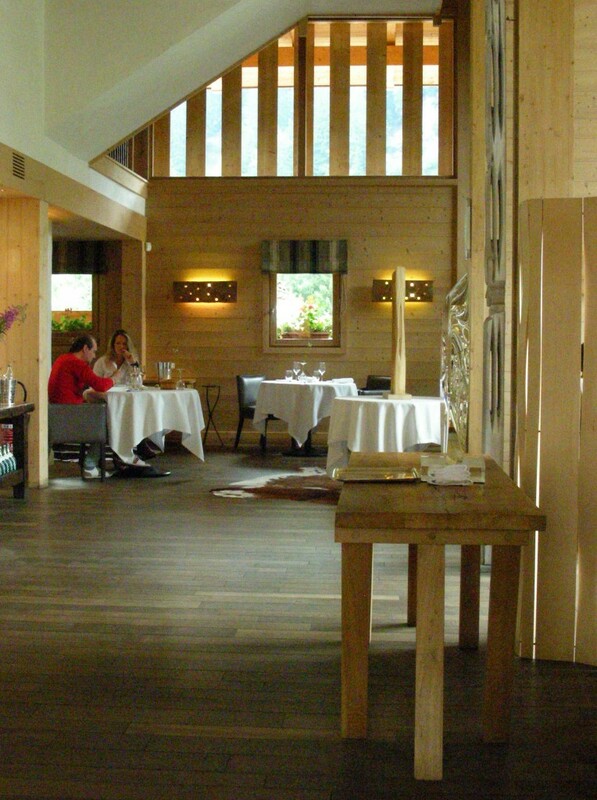 And now I’ve eaten in one of the most recent recipients of three Michelin stars, Emmanuel Renaut’s Flocons de Sel restaurant near Megève in the French Alps. I’d eaten in one- and two-stars before, never a three. Three Michelin stars traditionally represent the most august of all accolades in the food world, for some the only one that counts, but they come with a certain ambiguity. 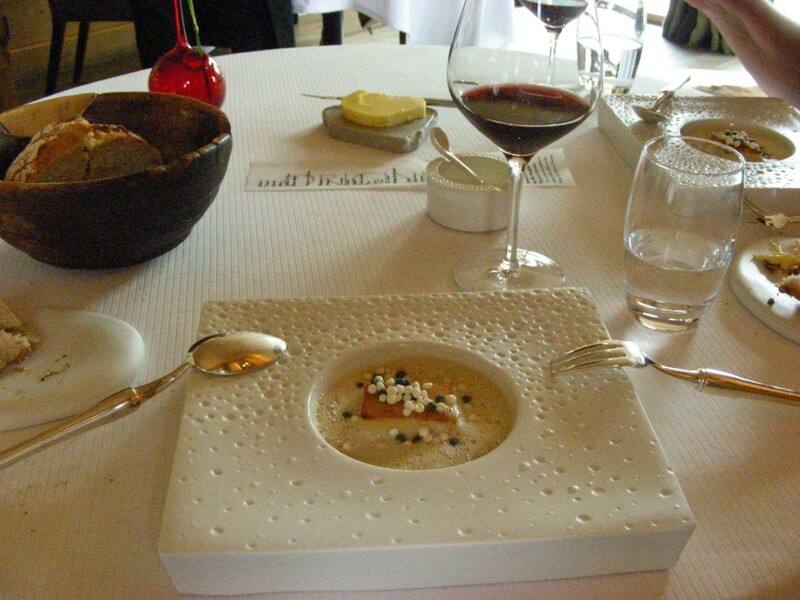 In much of the English-speaking media, especially, there’s an established double-edged ritual: on the one hand, trois étoiles are infinitely desirable, but on the other they and the whole Michelin star system are to be huffed at as attempts to sustain an old-fashioned, unwaveringly French traditionalism and stuffiness out of touch with modern tastes, all the dynamic flow of the-latest-trend eclectic-fusion cuisines, modern eating habits, etc etc. Eating in a three-star restaurant, strident journos on a what-do-the-French-know-anyway kick like to hint, is a matter of being duly impressed and paying homage to fusty French social rituals rather than actually a pleasure, especially if it’s in France itself. So you don’t know quite what to expect. But, to cut to the quick: none of this applied. Eating at Flocons de Sel was a joy, and genuinely memorable. It’s located up a narrow switchback lane that climbs the valley side above the resort town of Megève, in a chic modern variation on the ubiquitous chalet architecture of the Alps. From the terrace where we sat for our apéritifs and appetizers there is a sumptuous view down over the slopes (fabulous views are naturally par for the course in this area, but this was to be appreciated nonetheless). Inside the dining room is light, mellow and airy, with tall windows, plain wood walls and discreet contemporary sculpture. Service from the greeter at the door to the most junior waiter was warm, professional and thoroughly charming, with not a trace of the much-feared stuffiness and snooty froideur. The maître d’ was supremely smooth and considerate, speaking French to us when we could and changing into perfect English when we needed it, but as a courtesy, not in the immediate I-see-you’re-foreign-so-I’m-going-to-put-you-in-that-box-and-not-listen psychological game kind of way associated with tourist restaurants. The young and keen sommelier explained the varieties of local Savoie wines to us with an engagement that left us totally un-patronised. As to the food. 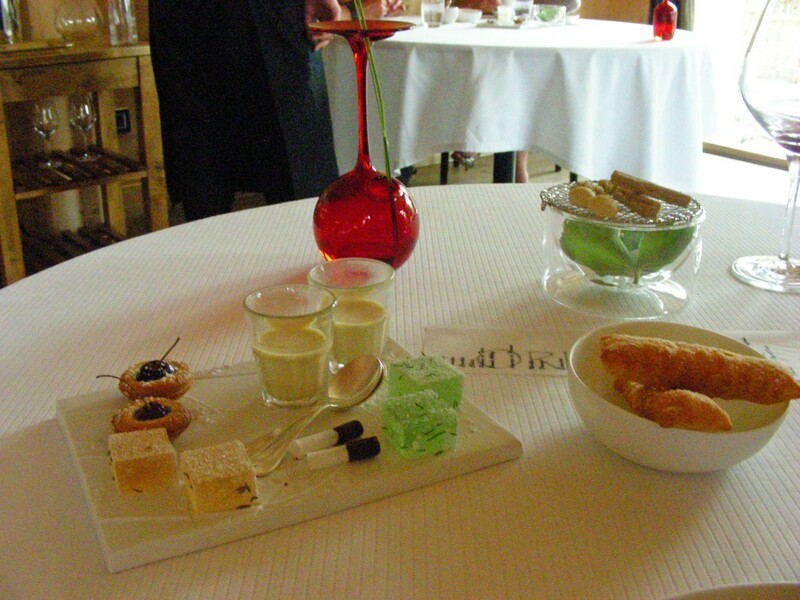 Appetizers, the amuse-bouches, are often highlights in fine French restaurants, little gems of creativity, and Flocons de Sel did not disappoint. On the terrace we were served tiny beignet pastries filled with a delectably subtle smoked meat and mushroom cream, and rice ‘biscuits’ topped with mountain herbs and flowers with piercingly fresh flavours. 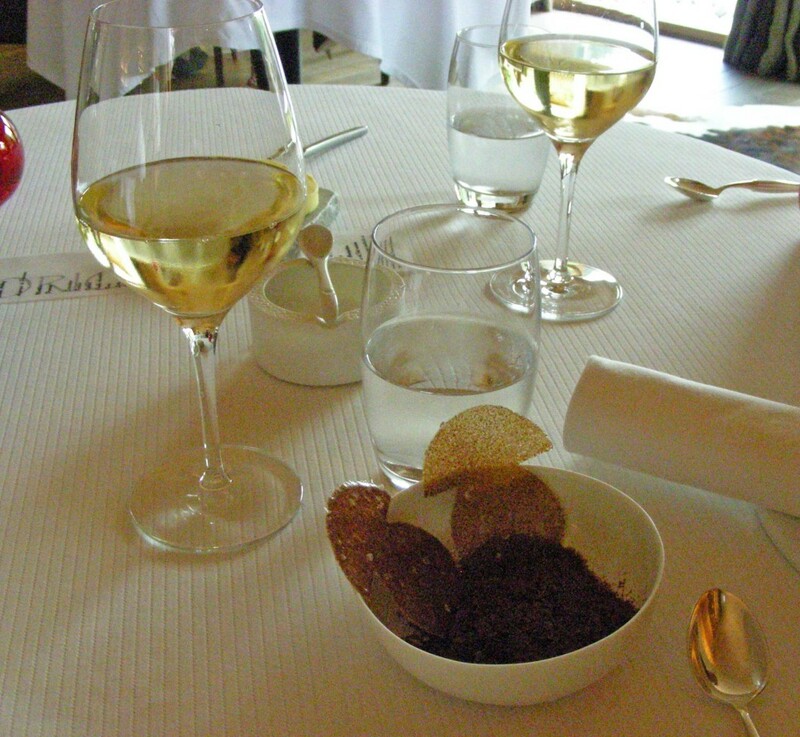 Then once we were inside came two more, beginning with some extraordinary cep potato crisps, concentrations of mountain mushroom that exploded in the mouth with one bite (should Emmanuel Renaut ever decide to give up gourmet cooking and go over to snack manufacturing, he could sweep the board). 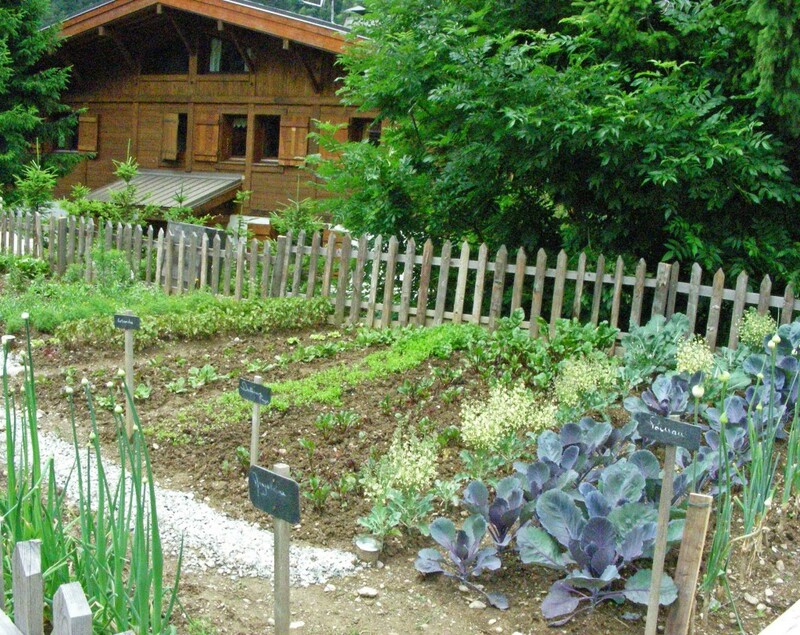 Like, apparently, all good French chefs nowadays Renaut is a dedicated believer in the local and using the produce of his own terroir – the mountainsides, pastures and lakes of Haute-Savoie – and virtually everything used in the restaurant is strictly seasonal and comes from within a radius of 50 to 80 kilometres. An exuberant garden right beside the terrace provides the kitchen with all its fresh herbs, several of which featured in the final curtain-opener, a beautifully deep-flavoured chopped tomato salad beneath a disk of tomato-infused ice. After that we finally got on to the lunch menu, which promised six courses, although as often the menu descriptions didn’t begin to describe the complexity of the dishes that arrived. First up was a Renaut signature dish, a warm vegetable millefeuille of ‘flavours from the pastures and gardens’, very fine layers of carrots, courgette, celeriac, more forest mushrooms and more, their vividness enhanced by a lovely hazelnut oil. Then came two fish courses. Firstly, grilled féra or vendace from Lake Geneva, with a fabulously rich but light mousseline sauce of carrot and lemon. It was accompanied by more ultra-special potato crisps, this time with a concentrated shot of lemon (we only got two each, but were considering whether it was allowed to ask for a bag to take out). Next was lake monkfish and pike on a buckwheat biscuit in a hugely intricate onion-based sauce that also included grains of barley and tapioca. This was a true tour de force, a web of deliciously changing textures and flavours, crunchy one second and gorgeously smooth the next. Our meat course featured perfectly rare beef, accompanied by little potato puffs that were more like distilled essences of roast potato than the actual thing, with subtle traces of cumin and cinnamon, together with intensely flavoured button mushrooms and a neat truffle tart. 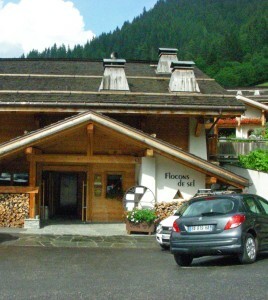 In a region like Savoy known for its cheeses – Reblochon, Tomme, Beaufort, Abondance – we expected a good cheese board, but Flocons de Sel’s cheese-chariot was still amazing for the sheer variety of strictly-local products it carried, including rare Alpine sheep and goat’s milk cheeses. And then came dessert. Maybe it’s just because it comes at the end, so you remember it better, or maybe because this is where French chefs really let their imagination run wild, but this is often a real highpoint of a fine French meal. And so here. 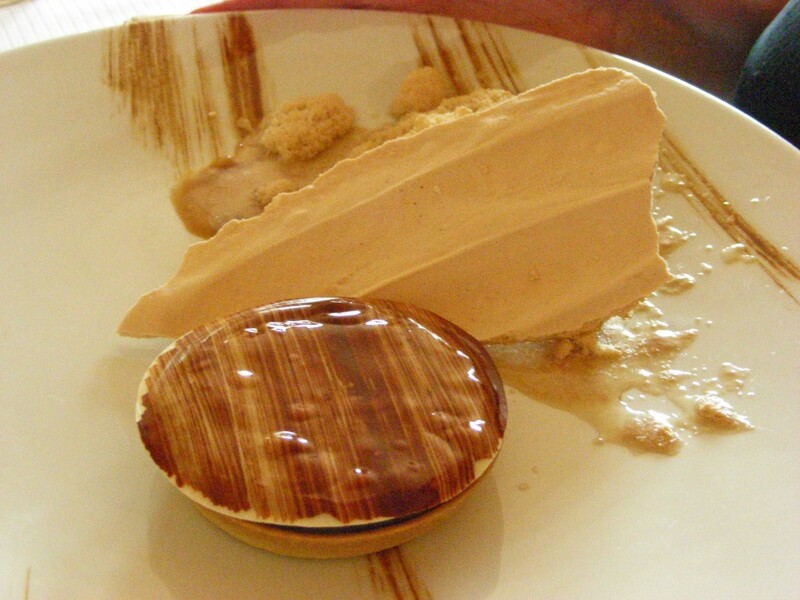 Essentially we had two, one a warm smoked-cedarwood and chocolate tart alongside wood-flavoured ice-cream. How do you get flavour from wood into ice-cream without it being revolting? No idea, but this was astonishing, like a mountain walk in delectably refreshing post-lunch form. 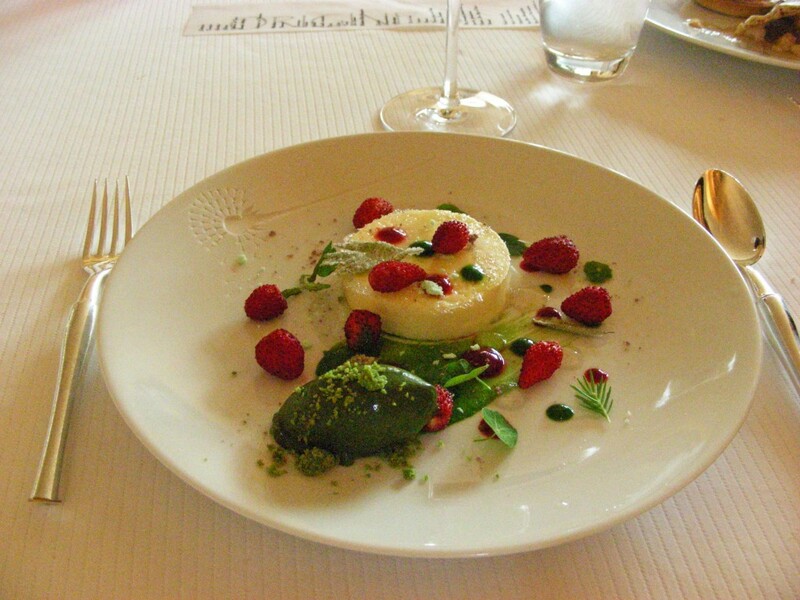 The other was a kind of blancmange, with mountain herbs, superb wild strawberries and another stunning wood ice-cream, this time of pine. Even then we were not finished, though, for we were soon presented with an utterly sybaritic array of petit-fours – little glasses of caramel cream, herb-filled cubes of Turkish delight, tiny chocolate capsules filled with liqueurs and more wood flavours, chocolates with hints of aniseed and nutmeg… Every tiny item put together with the same imagination, taste and immense care. And after that, we were gratefully led in to saluer a still-buzzing Emmanuel Renaut in his gleaming kitchen. The amount of skill, invention and attention to detail in this meal, in every dish and the quality of every ingredient, was extraordinary, an exhibition of high craftsmanship. It was also wonderfully enjoyable, a real special experience. On this evidence, the standards of the much-decried Michelin inspectors may be worth their billing. Of course, a meal like this costs. But it’s all to do with the excellent French concept of the rqp or rapport qualité-prix, the quality-price index. Cooking this painstaking and of this refinement cannot come cheap, but at Flocons de Sel you can see the price justified on the plate. So the quality-price ratio is very high. Whereas in plenty of high-ticket restaurants in cities like, for example, London (which is what I know best, I’m sure other places have their own examples), the rqp often drags along the floor. 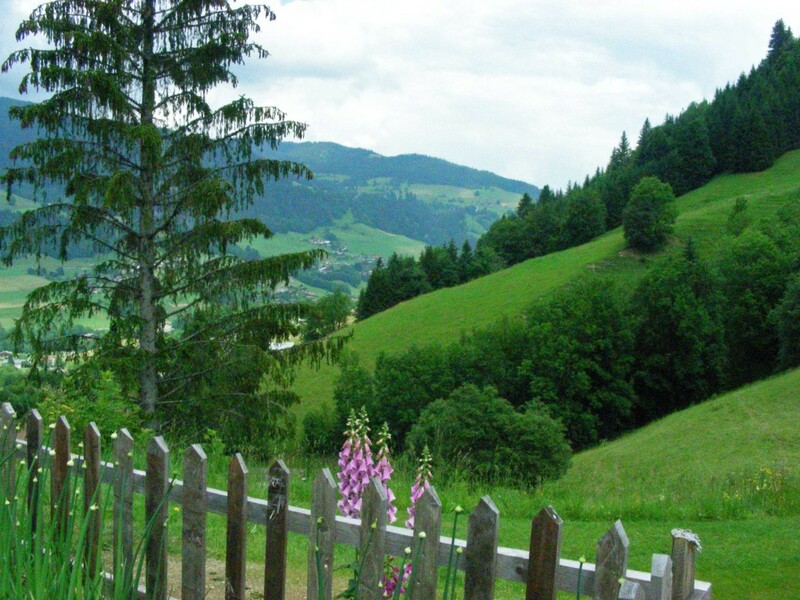 For info on Flocons de Sel, see http://www.floconsdesel.com/uk/flocons-de-sel-megeve-official-site.php. Congratulations! I envy your opportunities and how expertly you described them. I would not have said “your-foreign”, but wish I were smart enough to say many of the delicious turns-of-phrases you employed. Thank you for a luscious read. Whoops, you caught me out in an elementary blooper – now corrected. Thanks anyway for your very kind words.